Growing up in a very liberal family of card-carrying Democrats, I wasn't, to say the least, conditioned to develop an adulation of the Bush clan and its matriarch Barbara Bush. But as is so often the case, I read a great deal about her after her recent passing and found much to admire with regards to her life-long dedication to childhood education and literacy. 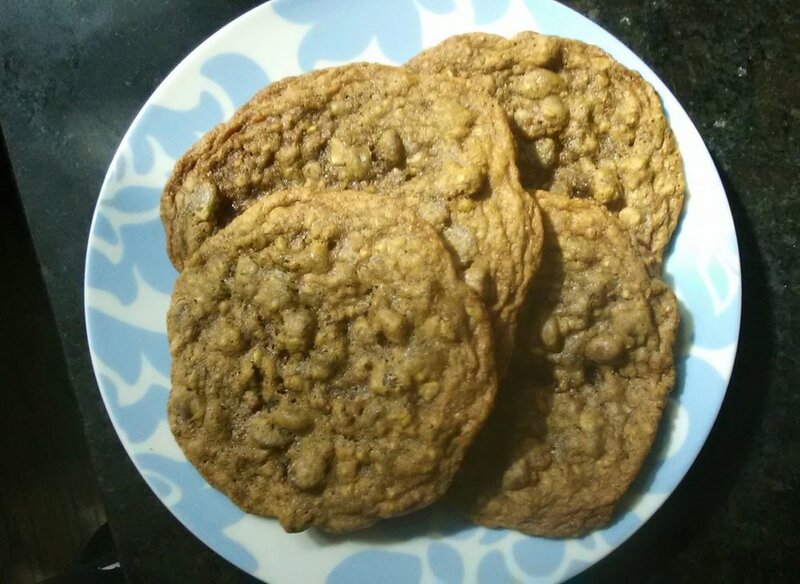 By making these cookies, I am not tacitly endorsing every damn thing she (or her husband) did or said. She wasn't perfect. But these cookies come close. Many thanks to my dear friend, Alicia Dietrich for sending me the recipe. 1. Heat oven to 350 degrees F. Sift together flour, baking soda, and salt onto waxed paper. Set aside. 2. Beat together butter, granulated sugar, brown sugar, eggs, and vanilla in a large bowl until fluffy. Stir in flour mixture until well blended. Stir in oats and chocolate chips. 3. Drop batter by rounded tablespoonfuls, 2 inches apart, onto ungreased cookie sheets. 4. Bake at 350 degrees for 10 minutes or until lightly browned. Transfer cookies to wire rack to cool.